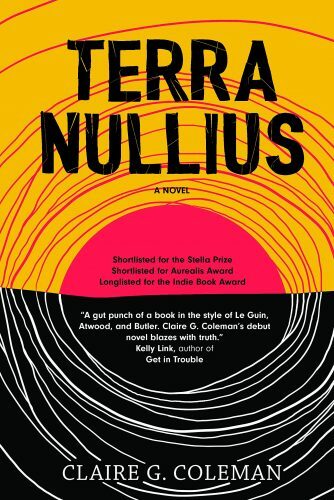 Coleman’s visceral debut novel Terra Nullius problematises, experiments with and retools the post-apocalyptic dystopia sub-genre to serve as a vehicle for what theorist Grace L. Dillon, of the Anishinaabe nation, has termed “Indigenous Futurism.” Influenced by Afrofuturist challenges to mainstream history as a crucial method in bringing about emancipatory futures, Indigenous Futurism seeks to centre pre-colonial cultural conditions, whilst examining how the subjugations of colonialism are still operative within the present. These excavations of underrepresented narratives offer strategies through which to imagine and build plural futures in which Indigenous peoples have greater political and creative agency. As such, Indigenous Futurism demands to know, “does SF have the capacity to envision Native futures, Indigenous hopes, and dreams recovered by rethinking the past in a new framework?” Terra Nullius, with its examinations of assimilation, landscape, and Indigenous spirituality and knowledges, is a brutal and elegant work which seeks to develop such a framework, through centring the cultural worlds British colonialism sought to extinguish. Full disclosure: at one point the narrative does a complete 180˚ pivot, which upends the coordinates of the world the reader thought they knew. As a consequence of this pivot, and my desire to not to spoil it for new readers, what follows will be my attempt to dance around this central fulcrum without revealing it. What I can say is that this plot manoeuvre is understated but masterfully rendered, in large part through SF’s unique estrangement of language. SF’s mutations of language are most clearly addressed by Samuel R. Delany in The Jewel-Hinged Jaw, where he discusses how a sentence such as “Her world exploded” could refer to both a literal and/or figurative event. This doubleness of language is used in Terra Nullius to completely unmoor our presumptions about how time operates in the novel, resulting in the future and past becoming completely entangled. Rather than just formal literary experimentation, then, this deployment of nonlinear time is elemental to how the plot functions, highlighting the ways in which more Indigenous and decolonialised forms of time are an equally valid means of apprehending the world. “Jacky was running,”(p. 6) pursued by vindictive “settlers” through the Australian outback, an escape from servitude which will become the novel’s backbone. The narrative is populated with a large cross-section of well fleshed-out characters, whose storylines are webbed together through their intersections with the Indigenous Australian Jacky’s fleet-footed flight from capture. Various points in Jacky’s escape, such as when he breaks into his old school looking for clues to find the home he was taken from as a child, cause colonial overseers to take umbrage at the perceived challenge to their authority. Jacky’s heist quickly becomes a legend of daring and rebellion which spreads amongst the Indigenous children imprisoned in the school. Instead of an optimised system of governance, then, the novel’s various sub-plots, involving internal intrigue, dissension, and political assassinations, help to characterise the colonial government as disordered and corrupt. ”Jacky was running,” and seeing double. Doubles, doubleness, and doubling are an important component throughout, with each character and idea reflected and shadowed by their opposite. At one point Jacky meets his own double and opposite, the colonial defector Johnny Star. As Jacky runs from colonialist alienation, Johnny runs away from the brutality of his compatriots, with both eventually finding a tentative home in a community of Indigenous refugees. Counterbalancing the hypermasculine trope of hunter and hunted which structures the novel, meanwhile, Coleman foregrounds two powerful female leaders: a young women named Esperance who increasingly takes on the mantle of leadership and acts as the empowering focal point of the refugee community; and the “settler” nun Bagra—a diabolical antagonist furthering the exploitative demands of the colonial government. As these doubled characters demonstrate, the novel brings together the POVs of both colonised and coloniser, providing insight into how different forms of violence and bigotry are responded to with resistance and resilience. “Jacky was running” through the landscape. It is no accident that the novel’s most lyrical passages are found when Coleman is describing Indigenous relations to, respect for, and ancestral understanding of Australia’s arid environment. Jacky’s spiritual experience with the landscape evokes something which refuses to be tamed, a profundity which cannot be captured or entirely destroyed. Jacky’s embodied spiritual response to the landscape gestures towards the endurance and regeneration of Indigenous civilisations with oblique, rather than certain, hope. Throughout the novel, Coleman does not offer any large-scale reconciliation, no easy solutions or fantastic resolutions, to the deep historical abuse and contemporary systemic oppressions inflicted by colonialism. There is no easy wish-fulfilment here. Instead, the novel retains a consistent level of brutality, suffering and struggle, with only small but important moments of sustained resistance, and glimmers of hope for a future where home can be found and new communities built. “Jacky was running,” a run which further galvanises and partially answers his need to find home. Jacky is not only running away from the violence and servitude imposed by colonial rule, but crucially, he is also running towards home. Unsurprisingly for a narrative centring the experiences of the dispossessed, the novel interrogates notions of, and attempts to find, home, as a fundamental drive, home as “a battle cry, a touchstone” (p. 105), a necessity for which each the characters in the book yearn. “Jacky was running” towards home. Jacky’s racing towards the lands of his ancestors is not only a spiritual reunion and a search for home; through word of mouth, it also becomes a story through which he is mythologised as a figure symbolising Indigenous resistance. Here the importance of oral traditions, reiterated at different moments in the text, builds a shared imaginary which helps to further bond remaining Indigenous communities together in a common sense of home. These oral traditions maintain Indigenous counter-histories which resist colonial claims to cultural superiority, whilst presenting counter-narratives which imagine a time when colonial rule will end. Oral traditions in the text are therefore a microcosm in which the unearthing of erased pasts helps to posit better futures, a practice which Terra Nullius, and Indigenous Futurism more generally, seeks to enact. Terra Nullius is a moving, horrific, and confrontational exploration of Indigenous Australian experiences of the apocalypse wrought by British colonialism. The novel demands that Indigenous voices and knowledges are included in the formation of shared futures. As such, it is a deeply necessary text. Coleman is an exciting new voice who has taken SF’s flexibility, and its position as arguably the best literary mode for the fictioning of the otherwise, and gone some way to realising the genres under-tapped potentials. Her work signifies how the SF genre can address past injustice, through remembering rather than trying to forget, and thereby nurture new ways of being collectively. Coleman’s work challenges SF to be better, revitalising and compelling the genre to realise its political importance as an incubator for counterfutures, alternative imaginaries and as a home for the people yet to come.